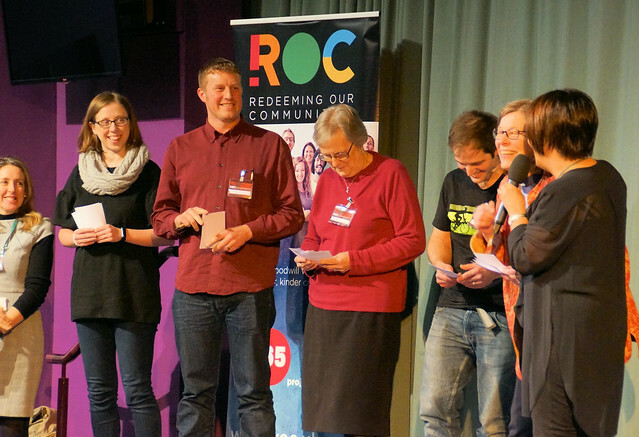 Over 160 people from churches, Christian organisation, civic bodies and the Police gathered at the King’s Centre in Norwich on Thursday night (February 7) to exchange ideas and passions around community engagement. Keith Morris reports. Organised by Debra Green, founding director of Christian charity ROC, and Oak Grove Community Church senior leader Darren Woodward from Norwich, the aim of the event was to bring together local people to celebrate all the good social action and community engagement activities already happening in Norwich and explore practical ways of doing even more, in a co-ordinated way. Participants had the opportunity to highlight and celebrate existing work before hearing short interviews with some key people from Norwich. Participants were then encouraged to share gaps in provision and specific needs from the community in small groups and then to explore practical ways of meeting those needs by working together and pooling existing resources and skillsets. Afterwards Debra Green told Network Norfolk: “We have done quite a few of these conversations around the county and the difference tonight is that this is a high capacity area – you can tell from the quality of the people in the room. The positivity generated and the willingness to be involved was great. “It was a good cross-section of people from faith communities and also from the statutory organisations. We do find that churches are often the ones leading on action going forward. I thought there was a real can-do positive attitude in the hall to make things change – so let’s roll our sleeves up and get things happening. “The next step is to analyse the feedback and date from tonight and look at what the key issues are and what some of the solutions might be,” said Debra. A ROC Conversation report will be published in a couple of weeks’ time and then Darren will be heading up an action group which will gather together to take things forward. Pictured top is Debra Green from ROC (left), interviewing Chief Inspector Sonia Humphreys from Norfolk Police at the ROC Conversation in Norwich.